CMG Detailing is proud to offer the professional version of Opti-Coat clear coating Opti-Coat Pro plus (OCP) to all clients. Opti-Coat Pro Plus is a paint protection product manufactured by Optimum Polymer Technologies (OPT), which is dedicated to making your vehicle shine through modern polymers and advanced surface-friendly formulas. Only authorized installers can apply Opti-Coat Pro paint protection to your vehicle, and CMG Detailing is one of the very few authorized installers serving the entire Milwaukee area. When you bring your vehicle to CMG Detailing for an Opti-Coat Pro Plus clear coat installation, the clear coating becomes a permanent part of your vehicle’s paint protection system. Just like the factory clear coat bonds to the factory paint base coat, Opti-Coat Pro Plus bonds chemically to the factory clear coat. If you are interested in seeing what Opti-Coat Pro Plus paint protection can do for your vehicle, give us a call at (414) 467-9094 to see how we can help preserve and protect the finish on your vehicle! Request a Quote or Consultation. • Opti-Coat Pro Plus packages start at $1399 for most small-mid sized vehicles. 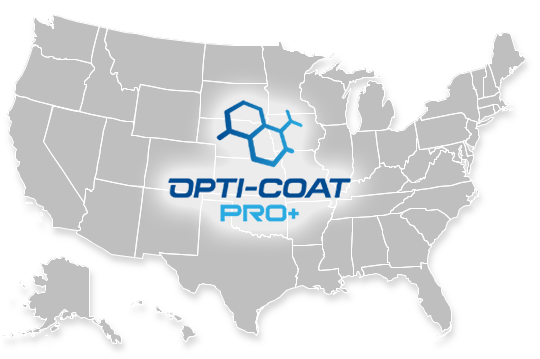 *Please note all Opti-Coat packages require yearly inspections to maintain the warranties and ensure the coatings are performing as intended. This $150 service includes a complimentary interior detail. Opti-Coat Pro Plus Delivers More Gloss & Same Protection! Opti-Coat Pro Plus is an enhanced 2 step version of Opti-Coat Pro. The first step, Opti-Coat Pro, is a ceramic clear coating warrantied for 7 years with superior resistance to scratching, chemical etching, fading due to UV and provides outstanding release properties. Opti-Coat Pro Plus adds great gloss and slickness for a fantastic shine and long term paint protection. Opti-Coat is a hard wearing, ceramic clear coat for superior resistance to scratching (9H) and protection from chemical etching due to environmental impacts. The Opti-Coat pre-polymer cross links, and forms a continuous protective film on the painted surface it is applied to, similar to a single component isocyanate that forms a clear coat finish. Opti-Coat has better chemical resistance, scratch & mar resistance, and release properties than any automotive paint coating in use. It provides permanent protection for all modern factory paints and can also be used to protect metal and hard plastic surfaces. Opti-Coat is not a paint protection wax or sealant that will wash away, or break down over time. Opti-Coat bonds permanently with the factory coating, protecting the surface indefinitely and will not delaminate. A single layer of Optimum Clear Coating measures approximately 2 microns in thickness. When compared to other paint protection products, Opti-Coat is more than 100 times thicker, with tests showing a wax coating measuring less than 0.02 microns. This allows Opti-Coat to effectively absorb damage that would otherwise affect the factory paint layers. Swirl marks and light scratches are not only decreased by the harder Optimum Ceramic Coating, the factory paint is protected and preserved. Opti-Coat is completely resistant to acidic environmental substances such as bird droppings. Unlike your factory clear coating that can be permanently damaged, Opti-Coat will not etch or dissolve when in contact with these substances, and a clean, glossy clear coating is maintained. Opti-Coat is hydrophobic, which means that water easily rolls off the paint, leaving your vehicle cleaner for a longer period of time. By maintaining a quality finish using Opti-Coat, your vehicle’s paint will not appear as worn, and this helps your vehicle maintain a solid resale value. Opti-Coat will provide you with a superior clear coat film and the most advanced paint protection product in the marketplace, that is resistant to chemical etching, and harder than factory clear coatings to reduce swirls and scratches. Opti-Coat will provide you with a permanent hydrophobic surface that is easier to clean, and stays cleaner for longer! Opti-Guard Fabric creates a superhydrophobic coating to protect fabric seats, carpets, fabric convertible tops and other textile surfaces. When liquids come in contact with Opti-Guard Fabric and closed loop textiles, the surface repels the substance and liquids roll off without penetrating or staining the material. Additionally, for materials with an open structure such as plush carpets where liquids are able to penetrate the surface, the coating prevents any penetration of the fabrics and permanent staining of the material. Opti-Guard Leather & Vinyl creates a hydrophobic coating with concentrated UV absorbers to protect leather seats and dashboards from premature ageing, cracking, and other damage such as colour transfer and staining of leather seats. Opti-Guard Leather & Vinyl is an acrylic hybrid resin that creates a strong, yet flexible coating for these softer surfaces and high resistance to chemicals. The coating contains special matting agents to maintain the original factory appearance of the surface it is applied to.